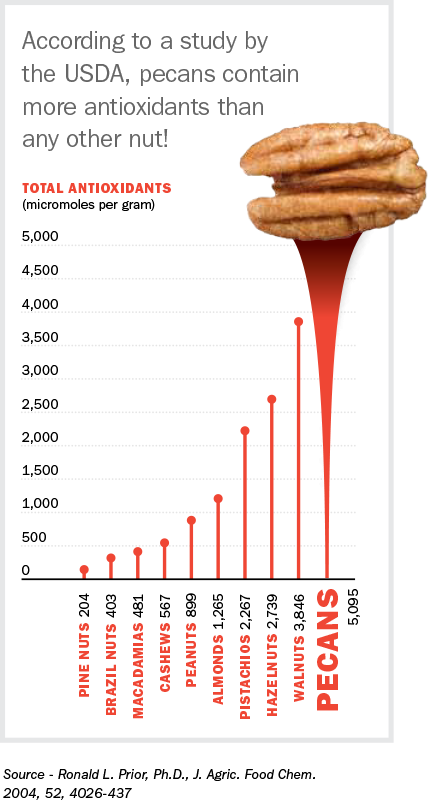 A laboratory analysis and comparison of the antioxidant power of 100 foods completed by the U.S. Department of Agriculture found that pecans ranked among the top 20 foods of antioxidant capacity. The study also found that pecans have the highest amount of antioxidants of the nuts tested, including almonds and walnuts. The antioxidant compounds found naturally in pecans, including vitamin E, ellagic acid and flavonoids, are believed to help prevent disease-causing oxidation in cells. Such oxidative damage has been linked to developing a wide variety of diseases including heart disease, cancer, and Alzheimer’s Disease. While eating pecans and other nuts cannot cure high blood pressure, they are an important part of the recommended eating plans of the National Institutes of Health as well as the U.S. Dietary Guidelines for healthy eating issued by the Department of Health and Human Services and the Department of Agriculture. They recommend four to five servings (1 ½ ounces per serving) of pecans a week. Research has shown that following these diets is an effective way to lower blood pressure, while supercharging your diet with much needed nutrients. Researchers from Loma Linda University in California and New Mexico State University, have confirmed that when pecans are part of the daily diet, levels of cholesterol in the blood drop. Pecans get their cholesterol-lowering ability from both the type of fat they contain and the presence of beta-sitosterol, a natural cholesterol-lowering compound. Eating 1 ½ ounces of pecans a day (27 to 30 pecan halves), as part of a heart-healthy diet, can reduce the risk of heart disease. © 2019 Navarro Pecan Company Inc. All rights reserved.